This is the doctoral project of Fiona French, who started in July 2014, supervised by Dr Clara Mancini and Prof Helen Sharp. 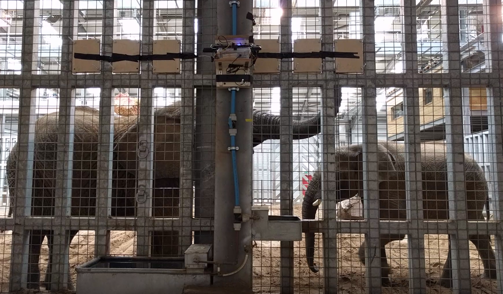 The project investigates the potential for using technology to support the development of sensory and cognitive enrichment activities for captive elephants. It explores the usefulness of applying conceptual frameworks from interaction design and game design to the problem of developing species-specific smart toys that promote natural behaviours and provide stimulation. In particular, the research adopts a Research through Design approach to inform the scientific inquiry and design process, through the creation of artefacts that guide the exploration of possible future solutions. Along these lines, the fieldwork so far has resulted in the development of an interactive prototype of an acoustic toy that elephants are able to control using interface elements constructed from a range of natural materials. More information is available on the project’s blog. French, F., Mancini, C., Sharp, H. (2017). High tech cognitive and acoustic enrichment for captive elephants. Journal of Neuroscience Methods, in press. French, F., Mancini, C., Sharp, H. (2017). Exploring Research through Design in Animal-Computer Interaction. Proc. Fourth International Conference on Animal-Computer Interaction, ACI’17, ACM Digital Library, to appear. French, F., Mancini, C., Sharp, H. (2016). Exploring methods for interaction design with animals: a case-study with Valli. Proc. Third International Conference on Animal-Computer Interaction, ACI’16, article no. 3, ACM Digital Library. French, F., Mancini, C., Sharp, H. (2016). Playful UX for Elephants. Symposium on Animal-Computer Interaction. Proc. Measuring Behaviour’16, Dublin University Press, pp. 445-448. French, F., Mancini, C., Sharp, H. (2015). Designing Interactive Toys for Elephants. Proc. Annual Symposium on Computer-Human Interaction in Play, CHI Play’15, ACM Press. French, F., Mancini, C., Smith, N., Sharp, H. (2014). Designing smart toys for the cognitive enrichment of elephants. Symposium on Intelligent Systems for Animal Welfare, ISAWEL’14, Proc. 50th convention on Artificial Intelligence and Simulation of Behaviour, AISB’14.